518 pages | 301 Color Illus. | 5 B/W Illus. 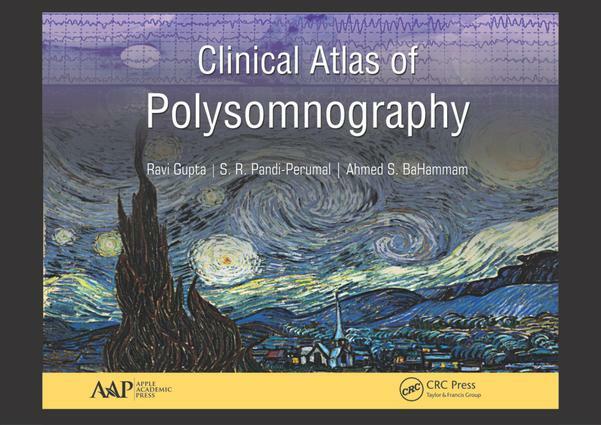 Written for sleep technologists, Clinical Atlas of Polysomnography provides basic information regarding normal sleep, sleep disorders, and electrophysiology that is outside of the scope of the AASM manual (AASM Manual for the Scoring of Sleep and Associated Events). It aims to act as a guide through the fundamental aspects of, for example, types of overnight sleep study, establishing a sleep laboratory, preparing the patient for a sleep evaluation study, placement of electrodes and leads, and the scientific aspects of such placement, i.e., why they are placed at that particular position. This information will be very useful in those parts of the globe where formal training in sleep technology is not yet available. Many further chapters focus on depicting real-time illustrations of sleep data as captured in the sleep laboratory and the scoring of recording data. Information regarding common montages, artifacts, and troubleshooting in the sleep laboratory will facilitate the reader’s journey as a trainee sleep technologist. While scoring sleep recordings, the "When you score the data" histogram can provide a great deal of useful information, and this has been explained in detail in this book. Most importantly, it is prudent to be able to write reports that are both informative and easy to understand by physicians who do not have advanced knowledge of sleep medicine. A chapter has been dedicated to explaining this in detail. Lastly, the authors have provided ready-made forms, questionnaires, and documents that can either be used as they are or with some modifications. This up-to-date and comprehensive volume will be an invaluable guide for technicians and physicians who wish to practice sleep medicine and will be useful for sleep technology and physician training programs. The volume is intended to complement, not be a substitute for, the AASM scoring manual, as many areas that are covered in the manual are not covered here. "Truly a comprehensive collection of invaluable information and graphical illustrations about everything that is needed to perform the polysomnographic assessment. From basic concepts about normal sleep and sleep disorders, technical information about calibration, artifacts, and various montages, to practical recommendations for managing a sleep laboratory, this atlas represents a superb reference guide. The atlas is filled with useful illustrations of actual records depicting standards for monitoring, artifacts recognition, and key findings associated with different sleep pathologies. A compendium of review questions at the end of each chapter is extremely handy for testing new learning. Although intended primarily for sleep technologists, this atlas will serve as a useful reference for any sleep clinician, researcher, or trainee wanting to learn more about the technical and clinical aspects of evaluating sleep and sleep disorders.The authors of this atlas, Drs. Ravi Gupta, S. R. Pandi-Perumal, and Ahmed BaHamman, are internationally known leading experts in sleep medicine and sleep research. They are to be commended for compiling this essential tool for a better understanding normal sleep and diagnosing many sleep disorders. This atlas is likely to remain a key reference in the field for years to come." Ravi Gupta, MD, PhD MAMS, Certified Sleep Physician (World Sleep Federation), is Associate Professor in the Department of Psychiatry & Sleep Clinic, Himalayan Institute of Medical Sciences, Dehradun, INDIA. In 2010, he received a Mini-Fellowship from the American Academy of Sleep Medicine to improve his skills in this area, and thereafter, he refined his knowledge and skills under the able guidance of Dr. Jim Walker and Dr. Robert Farney at LDS Hospital, Salt Lake City, Utah. He has contributed chapters to various high profile academic volumes. He is the author of both Indian and international books, including the book Psychiatry for Beginners , and has more than 100 published articles in various peer-reviewed journals to his credit. He has received numerous awards and fellowships, including the Indian Young Psychiatrist Award from the Indian Psychiatric Society (2008), fellowships from the World Psychiatric Association (2008) and from the Japanese Society of Psychiatry and Neurology (2009), and membership of the Indian Academy of Medical Sciences, New Delhi (2015), to name a few. He is engaged in imparting knowledge of sleep medicine to physicians from various streams through lectures, workshops, and training programs in his present institute. Ahmed S. BaHammam, MD, FRCP (Lon), FRCP (Edin), ABIM, EDIC, FACP, FCCP, is a tenured Professor of Medicine at King Saud University (KSU). Recognized as a leading expert in the field of sleep medicine, both nationally and internationally, Prof. BaHammam established the first academic sleep disorders center in Saudi Arabia and the first Sleep Medicine Fellowship program and subsequently chaired the committee that established the Saudi regulation for accreditation of sleep medicine specialists and sleep technologists. As a founding member of the Saudi Thoracic Society and the Saudi Sleep Medicine community, Prof. BaHammam has organized over 20 workshops on polysomnography. His advanced polysomnography courses have been conducted in several countries in the Middle East. For his contribution to sleep medicine, he was awarded the Lifetime Achievement Award (2016) by King Saud University. He has published more than 200 scientific articles. He is a member of the editorial boards of several international medical journals. Further information about his work can be found at http://faculty.ksu.edu.sa/ahmedbahammam/default.aspx.